The Telecommunications Regulatory Authority (TRA) wishes to boost the online commerce in the UAE by implementing new policies, said the National. “The TRA’s aim is to increase and boost the online transactions and the population who are using online commerce,” Ms al Jaberi said at The Internet Show in Abu Dhabi yesterday. Seeing this is the same department that is willing to suspend Blackberry services due to its encrypted nature; Would this mean that solely UAE payment gateways are to be used? Paypal, be worried. VoIP unblocked in the UAE, the UAE way. All hail, newspapers and radio’s stated that VoIP calls are now allowed in the UAE, but.. -and there’s a catch always- only “through licensed operators”. Of course, skype and vonage and the likes remains blocked, as they don’t generate revenue for the local market. Normal for a country with a large number of expatriates, whereby the telco’s main revenue is from overseas calls. 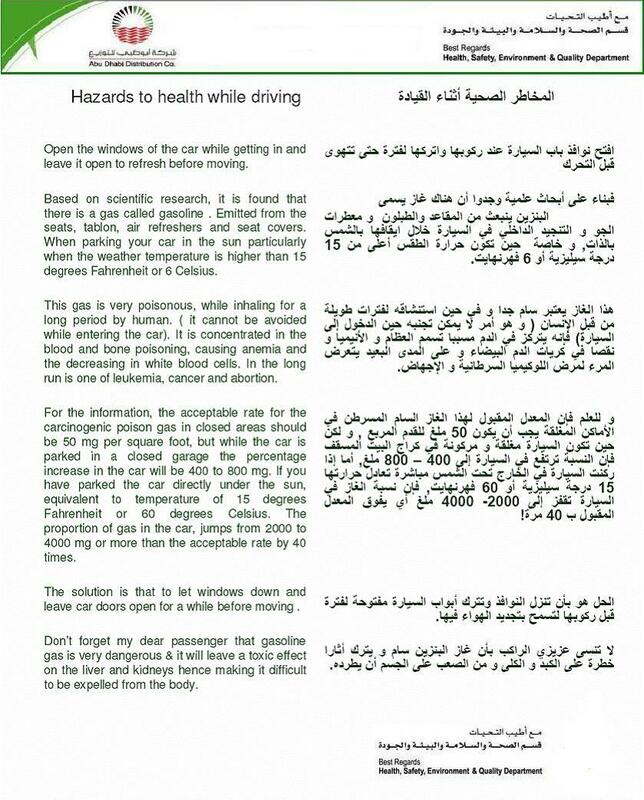 I got an email today from a colleague, warning about a poisonous gas called gasoline. Odd in a oil-rich country though. If you read it, you’ll notice that 15 degrees Fahrenheit is 6 degrees Celcius or 60 degrees Celcius. In reality, 15 degrees Fahrenheit is -9 degrees Celcius. I guess this memo wasn’t really talking about Abu Dhabi’s sunshine. Let’s assume that you don’t want to open the windows for a while when driving in -9 degrees. 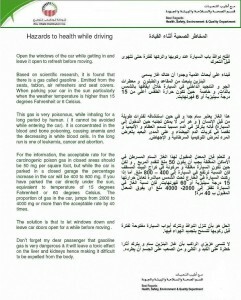 And that the gasoline fumes you get while filling up at a petrol station are bit more dangerous (or more fun?) then your average plastic seat covers. Yesterday evening, it was the Dubai Chapter of the Twestival. Twestival is a festival, organized by the Twitter community worldwide. Over 165 cities worldwide participated on this event to support the Charity Water foundation. The Dubai chapter was held yesterday in Barasti, Mina Seyahi. It was an amazing event, and had a great turnout. It’s very handy to put a person behind a “twitter username”, and met many new twitterers. 2 days ago, there was the 4th episode of Democamp Dubai. This event brings an opportunity for internet startups to present their product to the public – and it’s an amazing chance to do some networking and getting to know the people. I am looking forward for the following episode, I silently promised the spinbits guys to have a demo ready for that. 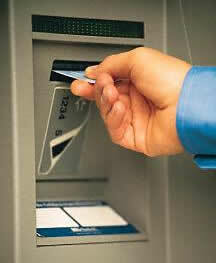 This post is not necessarily about the current credit crunch, and how Dubai is affected. Although it leans onto it. I just had a coffee with a good friend of mine, and we were speaking about the status of Dubai, and the entire region actually and it’s corporate profiles. And what is lacking is transparency. Ironically enough, a new body is being setup to provide transparency, accountability and governance. Anyhow, I refer to corporate transparency, what’s happening in the companies itself. I refer to blogging. Current modern copanies, such as Sun microsystems, Facebook, Google, etc all have corporate blogs, where employees; both executive management as any other layer, talk about their strategies, challenges and outcomes. In Dubai, very few companies do this, and especially none of the top 20 companies. In times such as the ones we are in now, many people are unsure about what is going to happen. I don’t expect any of the Dubai top companies’ CEO’s, or other key people, to have a crystal ball and foresee the future, yet any news insights would be welcome. Rather directly instead of usual channels such as news papers. Even prior to these less than perfect times, from an economical point of view. I am not sure about any UAE based top exec, giving in their own words how he/she is going to move the company forward, or just voice an opinion about global events. I don’t expect that to happen anytime soon, but it’s sad, nevertheless. We’re 2009 already (ok, almost), we should follow the global trends and get away from communication means and marketing techniques that are so 90’s. Dubai Police arrested a gang of Arab men, who stole over 200 million dirhams using credit cards doing online shopping, Gulf News said. They were tipped off in August about the guys, and caught most of them now (one out of four is out of the country).